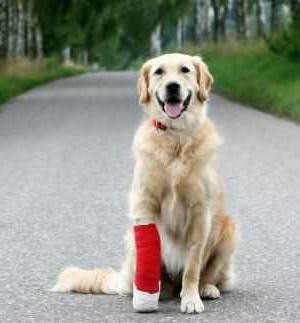 Transporting an injured dog is very crucial for the canine to live. 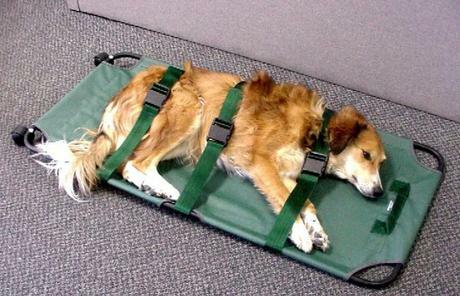 A dog in shock should be transported lying down on a flat surface or in a hammock stretcher to facilitate breathing and to prevent a sudden drop in blood pressure. Suspect a broken back or spinal cord injury in any dog who is unconscious or unable to stand after a fall from a height or after being struck by a car. These dogs require special handling. Artificial respiration is the emergency procedure used to assist air exchange in an unconscious dog. Heart massage (chest compressions) is used when no heartbeat can be felt or heard. When chest compressions are combined with artificial respiration, it is called cardiopulmonary resuscitation (CPR). Because cessation of breathing is soon followed by heart stoppage and vice versa, CPR is required in most life-threatening situations. While CPR can be performed by one person, it is easier and more often successful when done by two. One person does the artificial respiration while the other does the chest compressions. To determine which basic life-support technique will be required in an unconscious dog, see the chart on the next page.